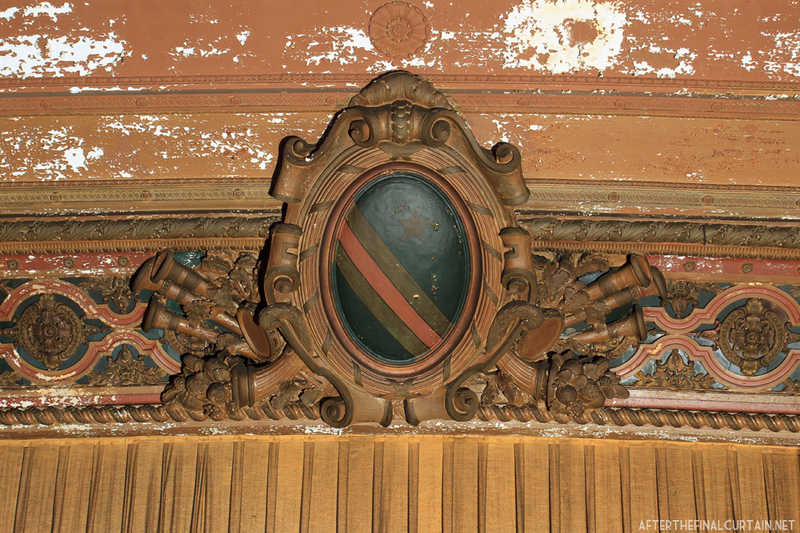 The top of the Ridgewood Theatre’s proscenium arch. 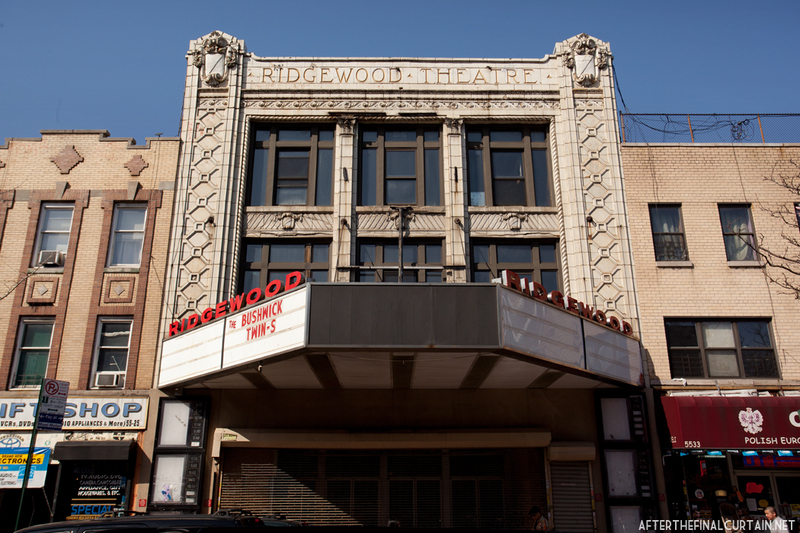 The Ridgewood Theatre opened on December 23, 1916. Located in the Ridgewood neighborhood in Queens, New York, the 2,500 seat theater was built by the Levy Brothers Real Estate firm. The Ridgewood was designed by famed theater architect Thomas W. Lamb, who is known for the design of many New York area theaters. 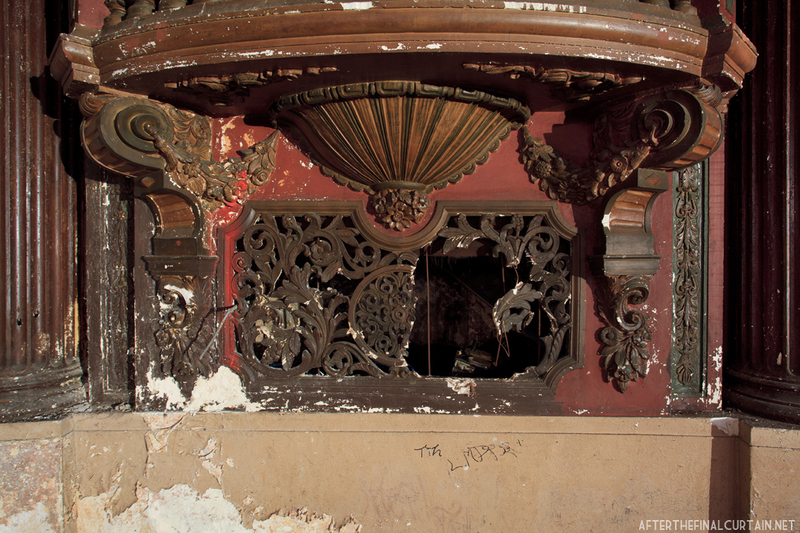 The Ridgewood was modeled after the now demolished Mark Strand Theatre, which was the first ever motion picture palace. 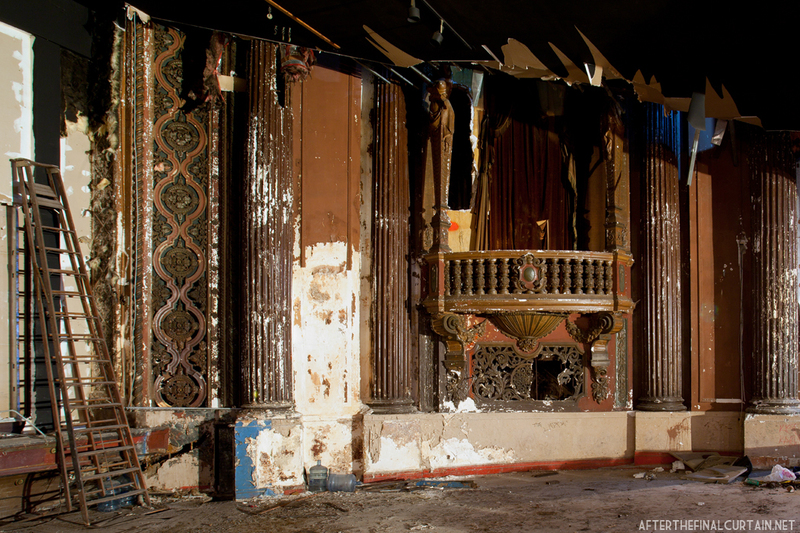 Ridgewood Theatre’s balcony was divided up in to three separate movie screens. The Ridgewood’s façade was constructed in the Beaux-Arts style, and used many classical elements such as pilaster and glazed terracotta shields. The interior was designed in a greek revival style, with murals depicting the history of the neighborhood. Some of the walls dividing the space have been removed on the main level of the theater, revealing the original decor underneath. The Ridgewood was operated by many theater management companies over the years, including William Fox, who added it to the Fox chain in 1923. The theater showcased many different forms of entertainment, from vaudeville to photo-plays to silent films. After the space was updated to show films with sound, the first all-talking motion picture, “The Lights of New York,” played at the Ridgewood in 1928. Due to the Great Depression and lawsuits from competitors, William Fox went bankrupt in 1936, and sold his interest in the Fox Theater chain. The main floor of the auditorium was divided into two separate theaters. After the theater closed, the wall separating the two was removed. The Ridgewood was purchased by the United Artists theater chain and turned into a five screen multiplex theater in the 1980s. 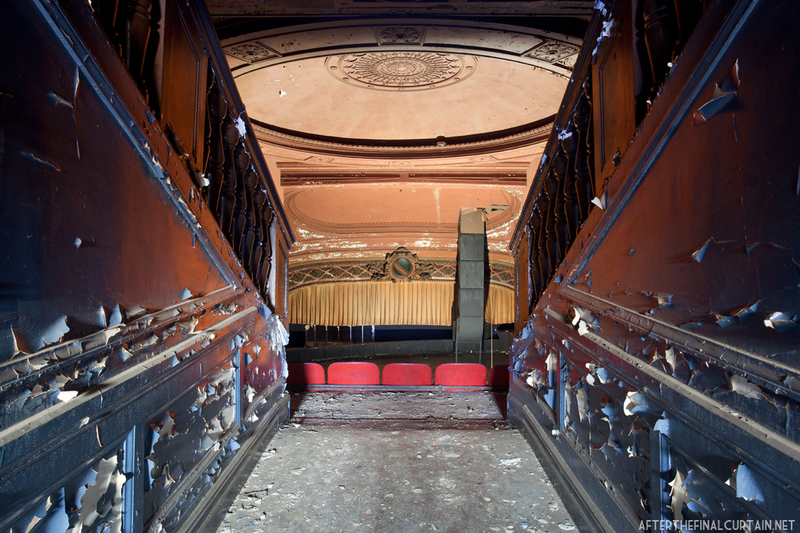 The balcony was converted into three separate theaters and the main level of the auditorium was split in two. It remained open during the multiplexing, the balcony was sealed off, and movies were shown on the main level. 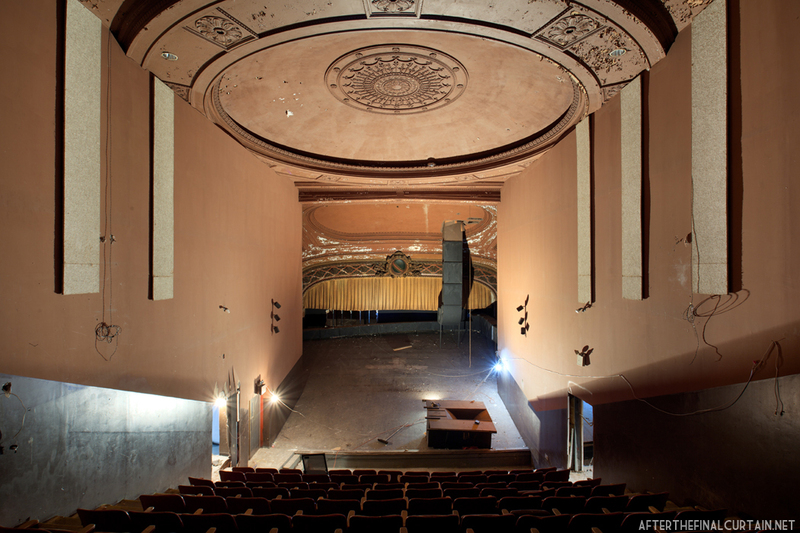 When the balcony was complete work began on the main level, and the movies were shown in the balcony theaters. 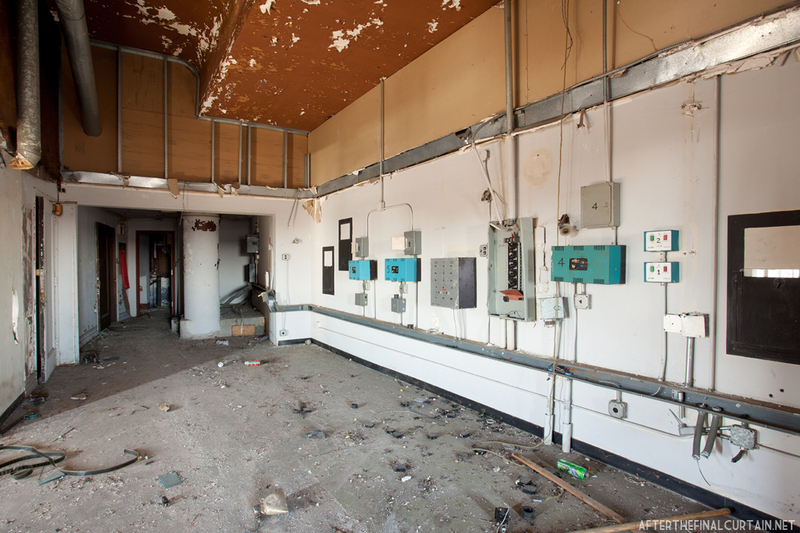 The original projector room still exists above its replacement. 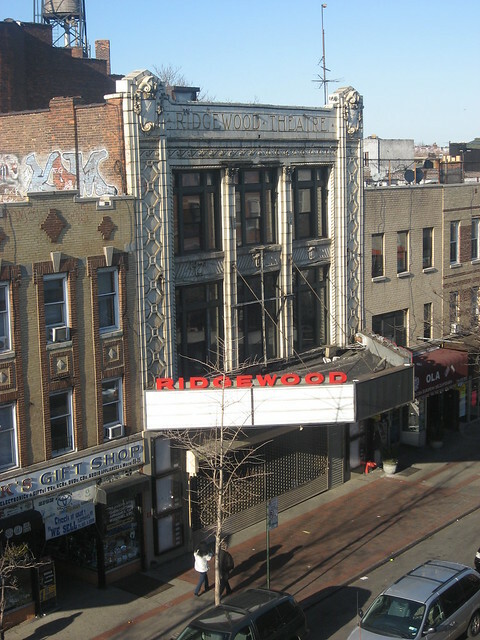 Because of declining ticket sales, the Ridgewood Theatre closed in March of 2008. When it closed it was the oldest continuous first run movie theater in the country, partially because it never fully closed during the multiplexing. The façade was declared a landmark by the NYC Landmarks Preservation Commission in January 2010. Although there have been a number of proposals for the reuse of the theater since its closing, there are currently no plans to reopen. 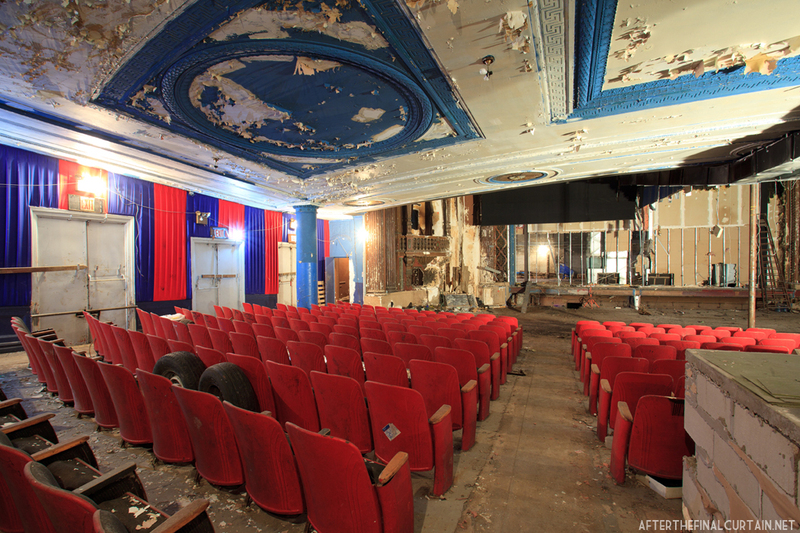 The theater was gutted in 2014 to make way for condos. The landmarked facade of the Ridgewood Theatre. 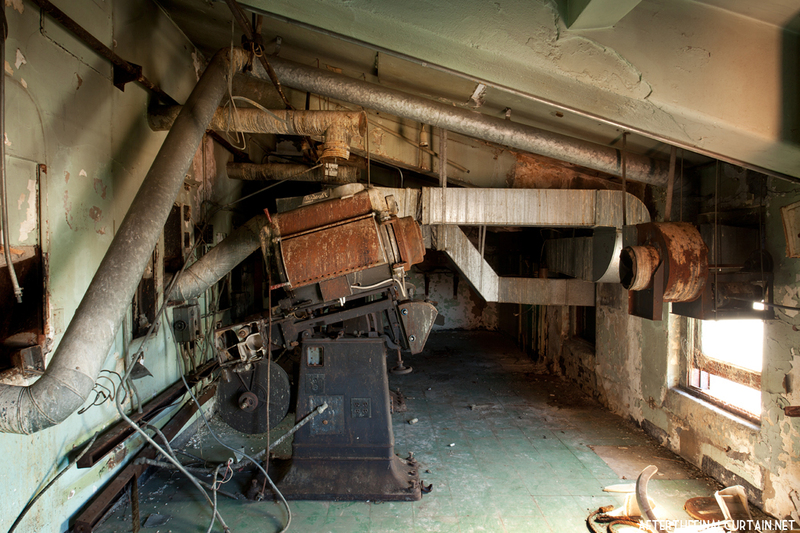 A new projector room was built at the top of the balcony when the theater was multiplexed. 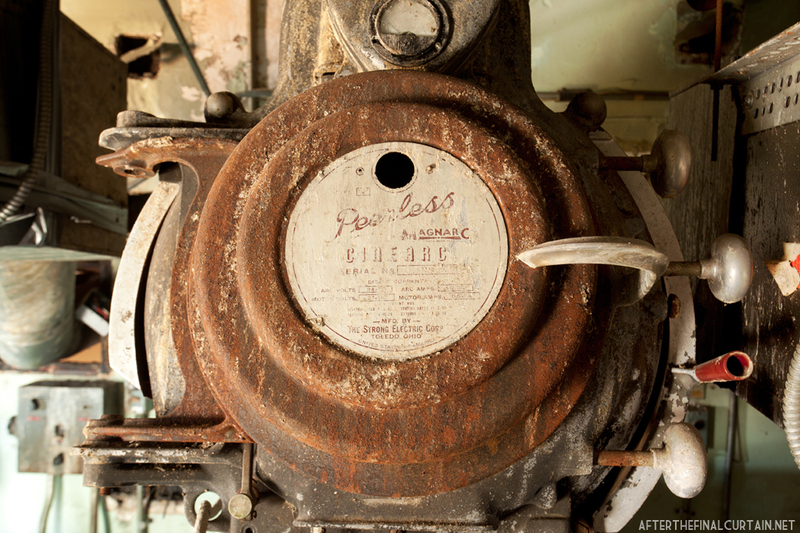 A close up of one of the original Peerless carbon arc projectors. A chandelier still hangs in the entryway of the theater. 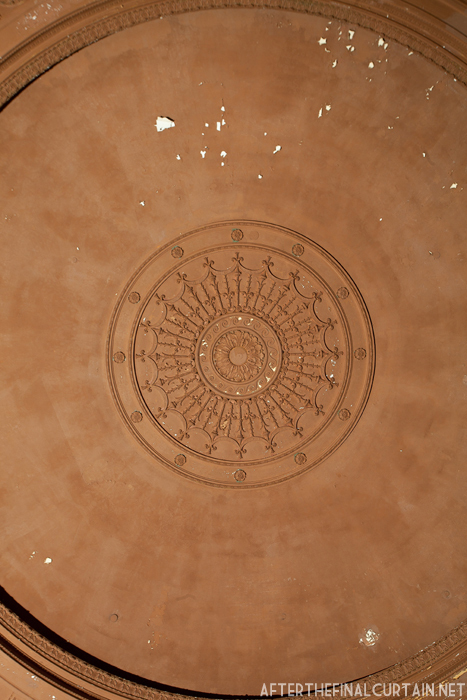 A close up of some of the plaster and woodwork that was discovered after the mulitplexing was removed. 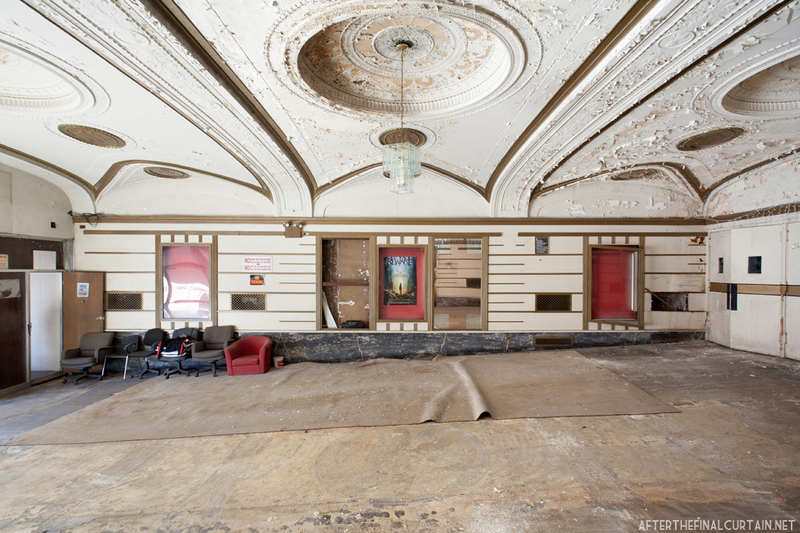 The original ceiling remained visible after the theater was multiplexed in the 1980s. One of the original entrances to the balcony level. Its so sad to see this wonderful places in such bad shape. Amazing it is in such sad shape for being closed only 4 years. thanks for the inside look at the theater. i remember going there to see movies back in the early sixties. of course, it was always dark in side, so i never got to see the details like you show. http://www.flickr.com/photos/8095451@N08/2714853531/ what it looked like years back, back when myrtle ave was an avenue! if you start at that flickr page, the next 2 or 3 pics (to the right in the stream) are more pics of the ridgewood in 2005. I think the theater should be saved it’s a great building. Thanks, as always, for letting us see what’s been left in the dark. I’m shocked at the restraint shown by United Artists – the other UA multiplex conversions I’ve seen appear to show that UA was on a mission to destroy as much of the past as they could. Are there any more pictures of the theatre? Would love to archive it. Not that I took. What do you mean by “archive it”? I’m trying to collect photos of the different areas of Ridgewood both interior and exterior. Older shots with contemporary ones to add contrast. I wanted to archive them for myself or set up a web page in the future.